You can export your Password Manager data for security purposes, data recovery, or when you transfer your Password Manager data to a new computer. Your vault password cannot be reset. 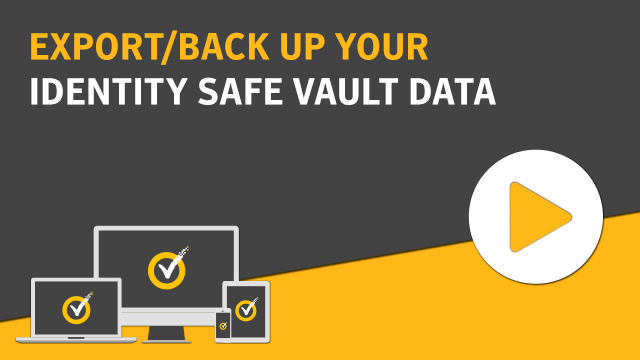 So, Symantec recommends that you back up your vault data periodically. When you enable automatic backup feature, backups of your vault are automatically created and stored locally on your device. You can retrieve Password Manager data when your product expires. Norton Password Manager does not allow the export of Norton Password Manager (.NPM) files. Click Norton Password Manager on the top-right corner of the browser. In the pop-up that appears, click Open vault. In the Unlock your vault window, type your vault password and click Open vault. Click the Norton Password Manager extension icon and click Vault. In the Norton Password Manager window, click and click Export vault. In the Protected vault Action window, enter your vault password to export the Norton Password Manager data. In the Norton main window, double-click Online Safety, and then click Password Manager. In the Norton Password Manager window, click the Settings icon available at the bottom of the window. In the Export pane, select the file format. If you want to back up your data with a password for more security, type and confirm the password. You can access your vault backups at My Documents\Norton Password Manager Backups\<Norton account name>. In the Validate Password for Password Manager window, type your vault password to export your Password Manager data. In the confirmation dialog box, click OK.